Drop Your Drawers promises to be even bigger and better in providing new underwear for children in need at Campbell County elementary schools, with author and illustrator Dav Pilkey’s “Captain Underpants” leading the way. 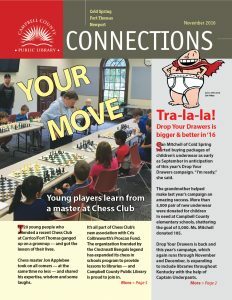 Read about how Chess Club at Carrico/Fort Thomas gives young players the opportunity to learn from a master through Cris Collinsworth’s ProScan Fund. Expand your horizons by learning T’ai Chi or becoming a barista. Super Kids can become superheroes for a day at Newport. Read about all about a busy November at the Library here.